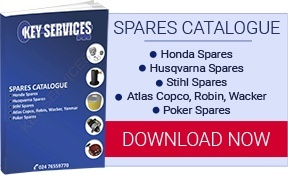 Online Suppliers of Poker Spares, Engine Spares, Hydraulic Spares and Many More Power Tools and Power Tool Parts! Great Online Prices and Fast UK Delivery! We are a family run business with over 40 years experience in construction and civil engineering equipment sales, spares and repairs. We specialise in concrete compaction and surface preparation Equipment. We offer a a fast reliable and very competitive service including collection and delivery. Your one stop shop solution. The team at Key Services pride themselves on their ability to provide their customers with the best quality power tools at the best prices! Offering you an impressive range of Trade and DIY power tools with prices that represent quality and fantastic value for money! They believe their extensive knowledge and fantastic service alongside the experience they have built up over our 35 years of trading is the reason they have remained so successful within the construction industry. They pride themselves on providing an outstanding service and the most competitive prices within the construction industry. Feel free to browse their website and see the fantastic range of power tools and power tool parts they have available to buy online including Vibrating Pokers, Pneumatic Breakers, Hydraulic Breakers, Petrol Cut off Saws and many more! Finding a small petrol engine for sale in the UK is easy. Numerous distributors offer their services across the country. However, choosing a retailer with a wide range of products by established brands may not be as simple as it seems. What Are Your Options For Buying An Industrial Water Pump In The UK? There are numerous options when looking for industrial water pumps for sale in the UK. Among the popular industrial water pump manufacturers, you are unlikely to find a UK company. However, the majority of leading manufacturers have distributors in the country.